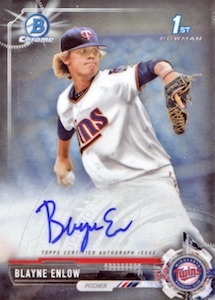 A tradition for card collectors, the hunt for big-time MLB talent normally takes place via the Bowman brand. 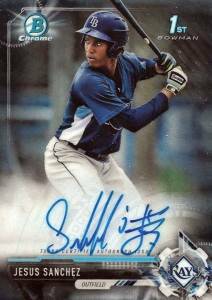 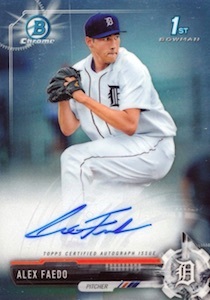 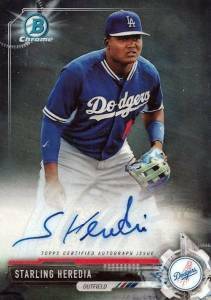 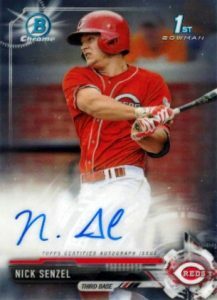 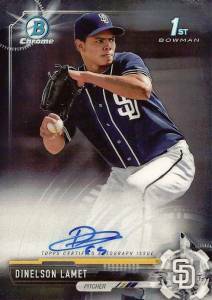 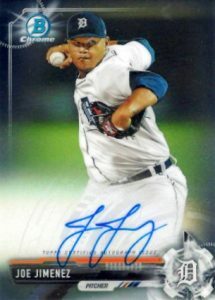 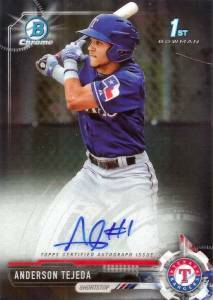 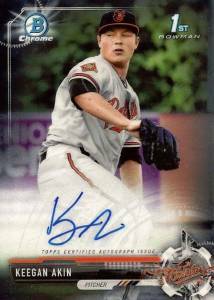 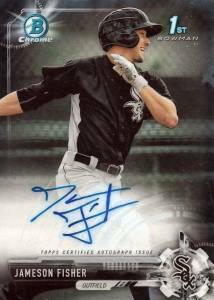 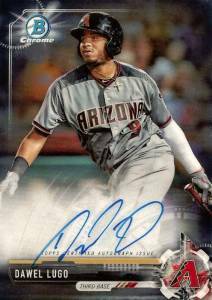 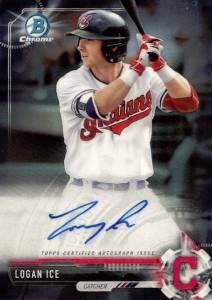 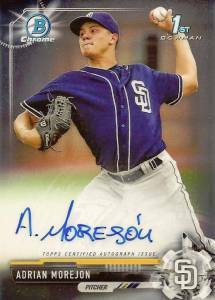 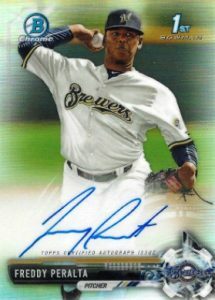 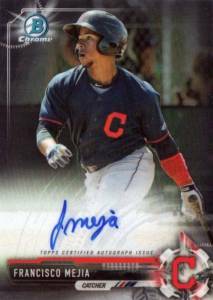 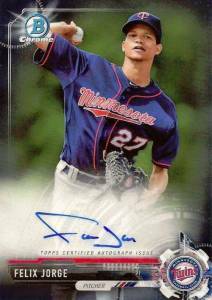 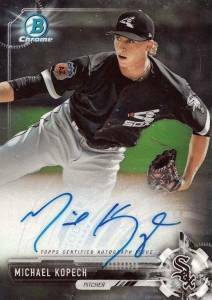 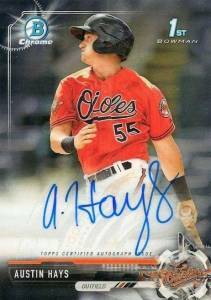 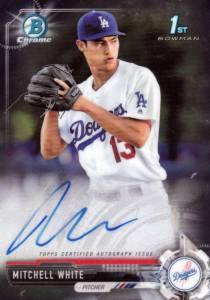 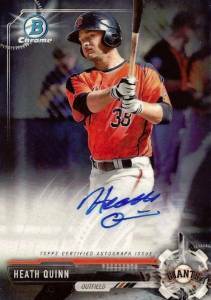 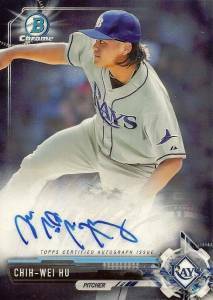 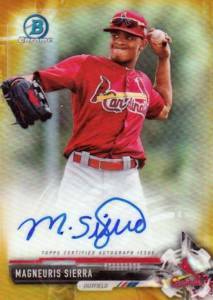 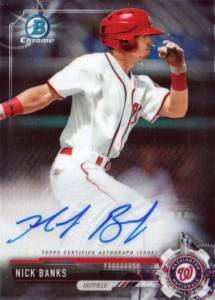 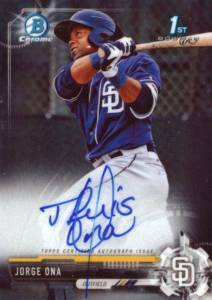 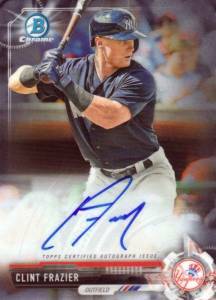 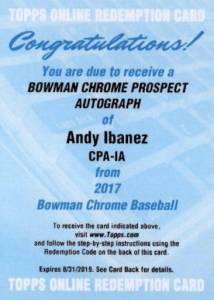 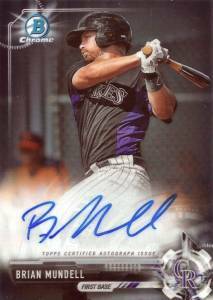 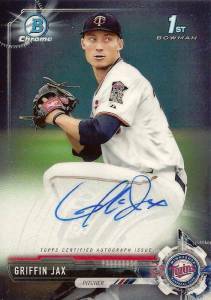 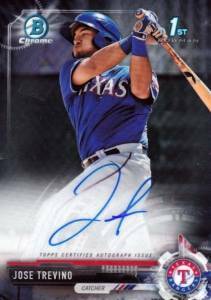 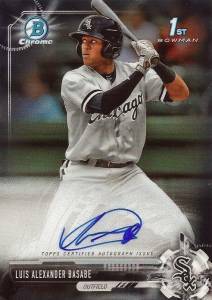 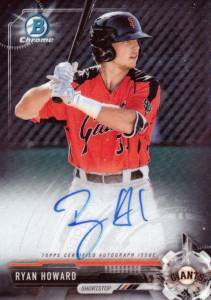 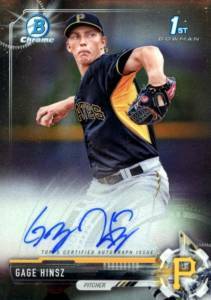 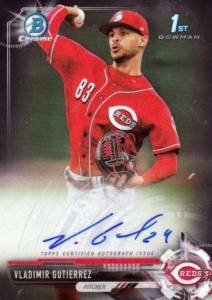 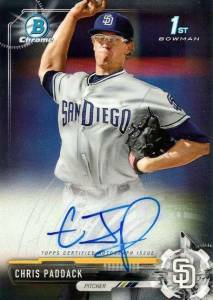 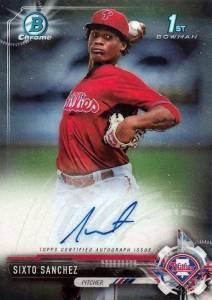 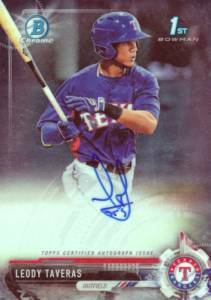 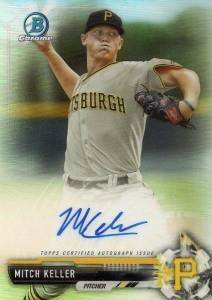 In this case, we are talking specifically about the 2017 Bowman Chrome Prospect Autographs. 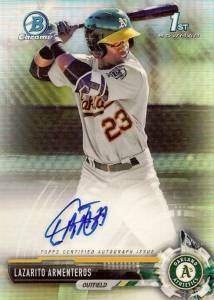 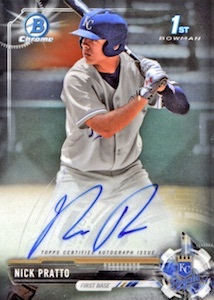 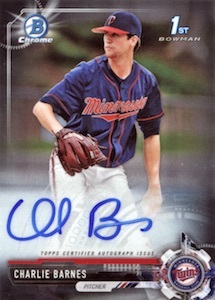 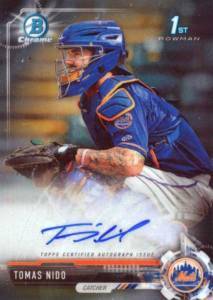 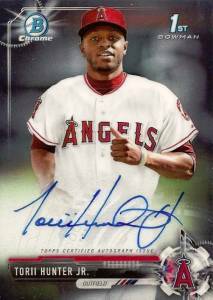 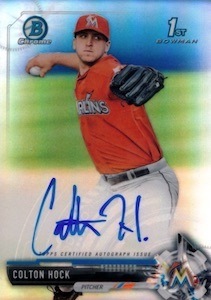 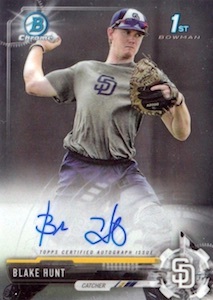 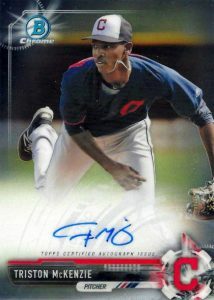 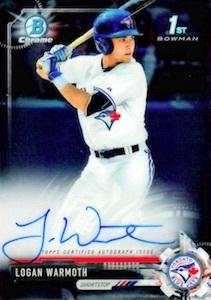 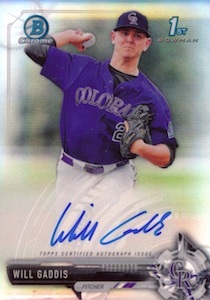 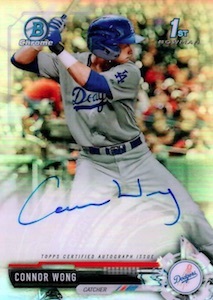 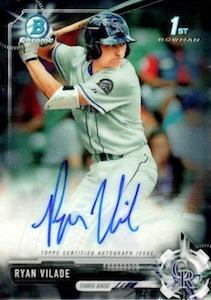 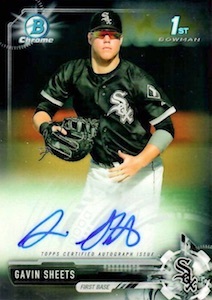 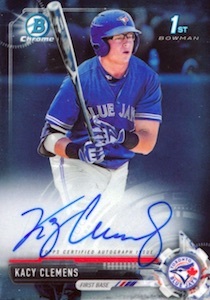 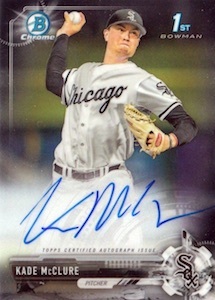 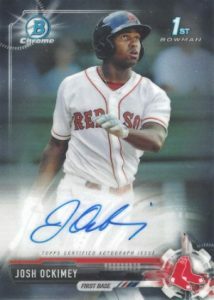 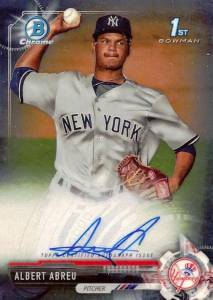 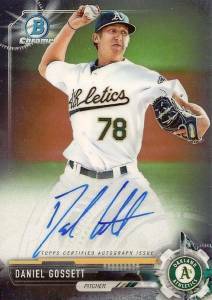 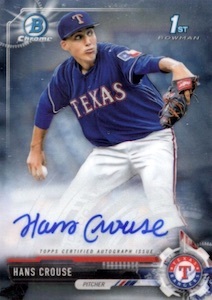 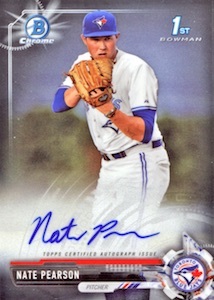 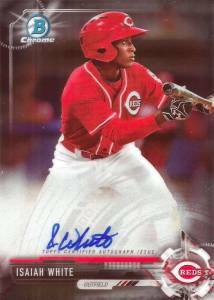 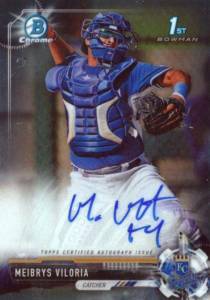 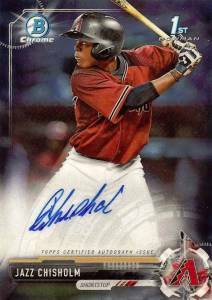 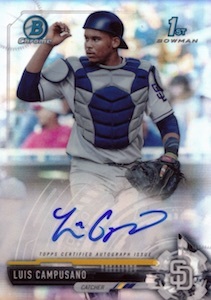 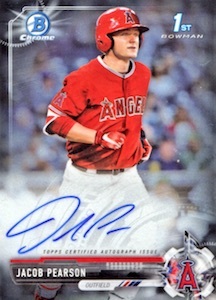 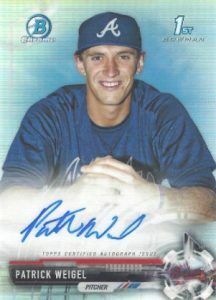 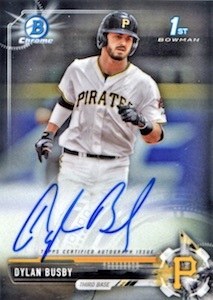 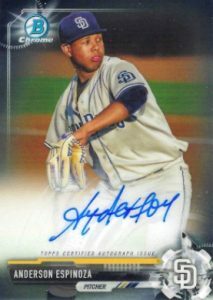 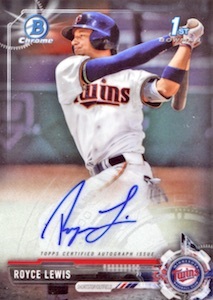 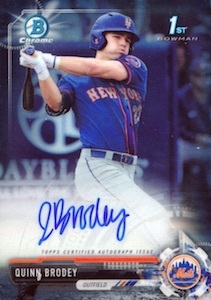 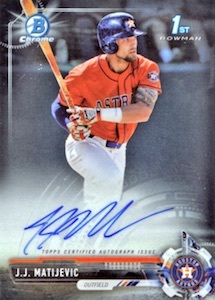 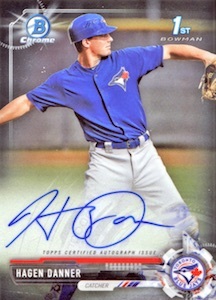 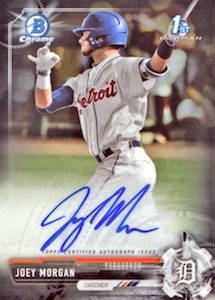 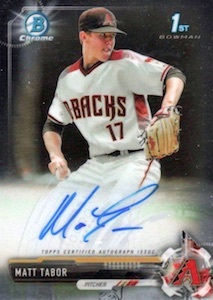 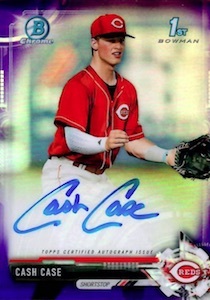 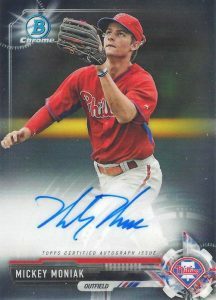 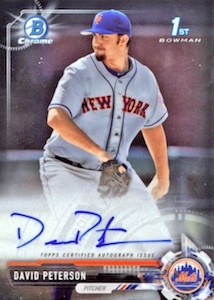 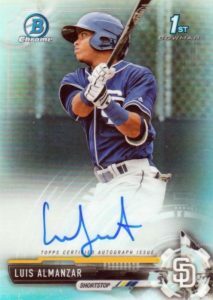 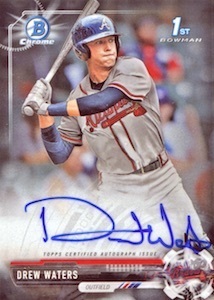 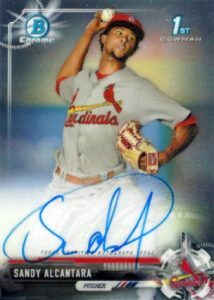 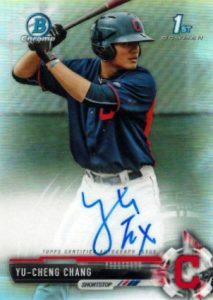 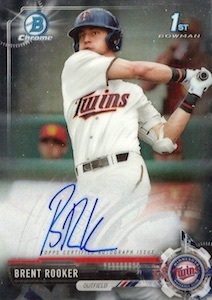 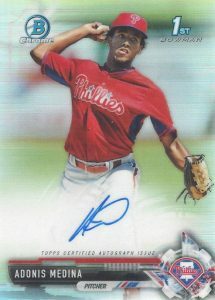 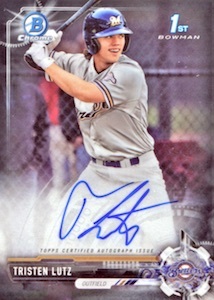 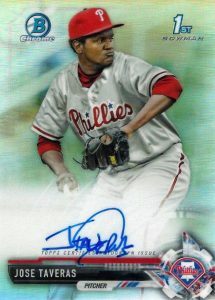 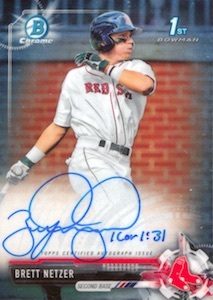 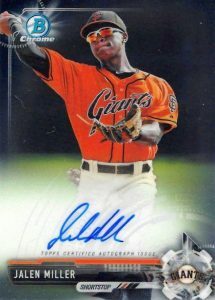 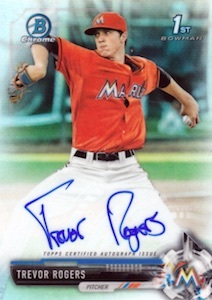 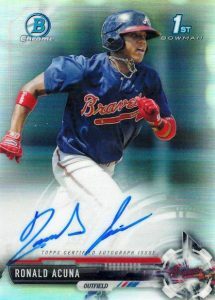 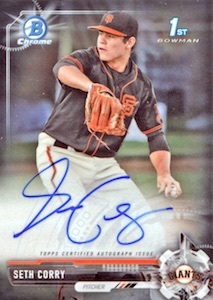 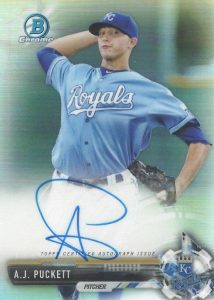 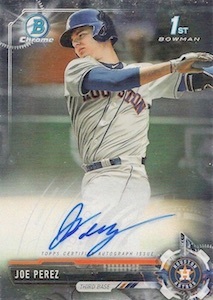 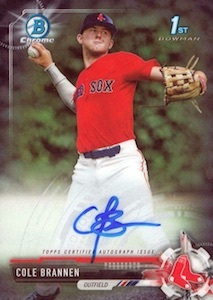 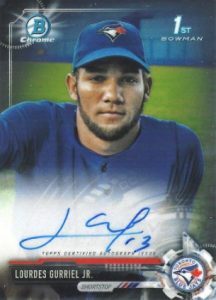 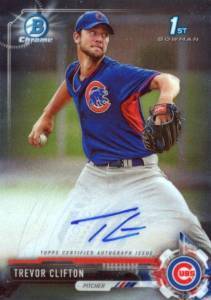 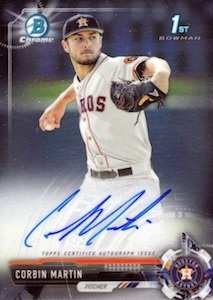 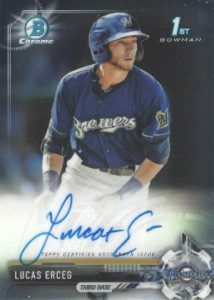 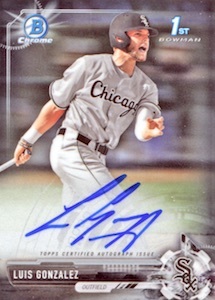 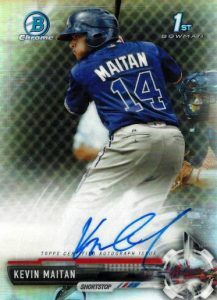 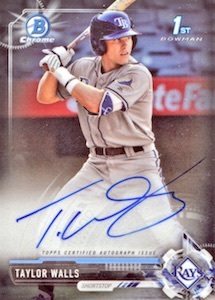 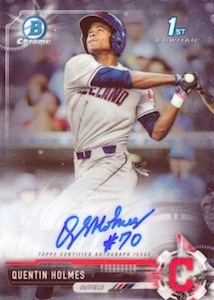 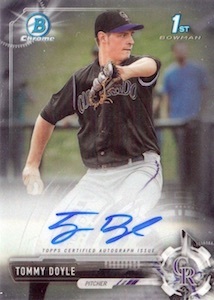 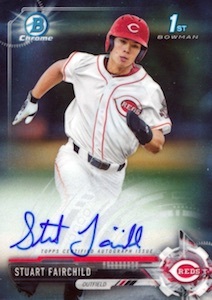 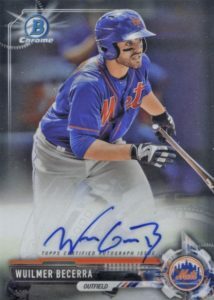 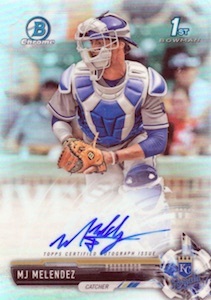 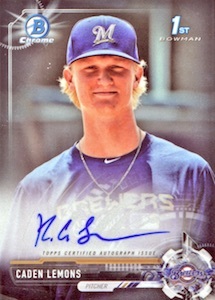 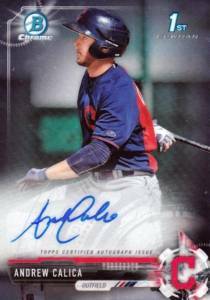 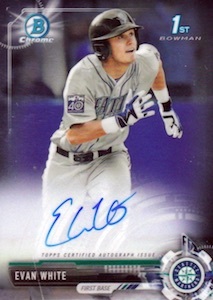 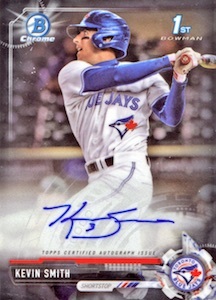 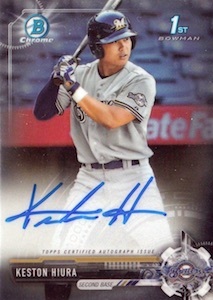 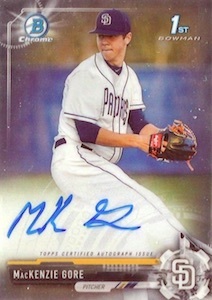 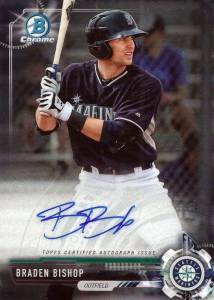 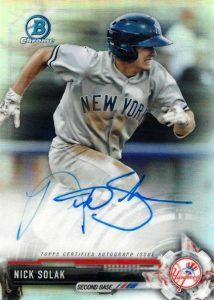 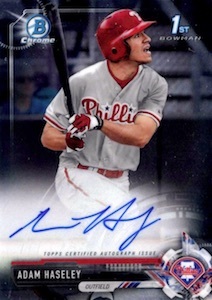 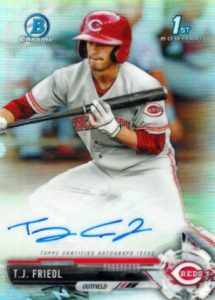 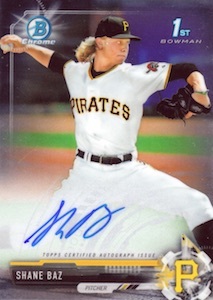 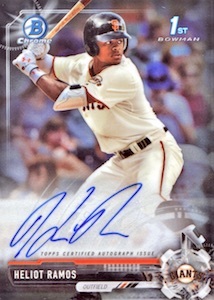 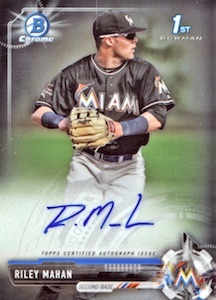 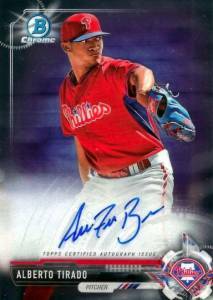 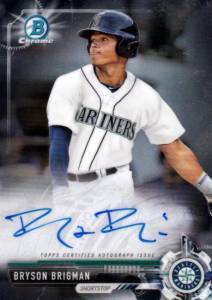 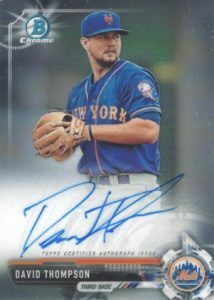 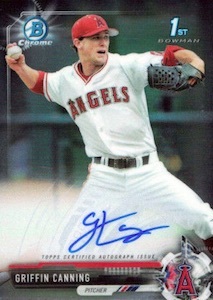 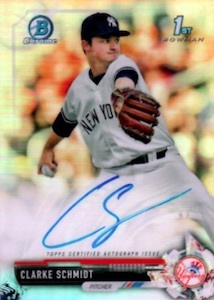 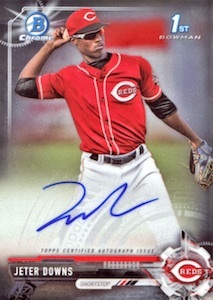 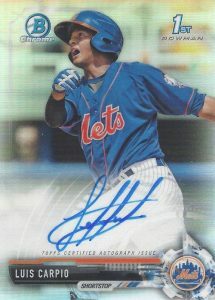 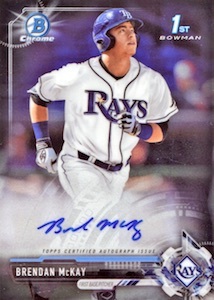 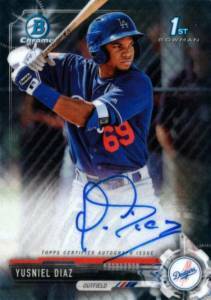 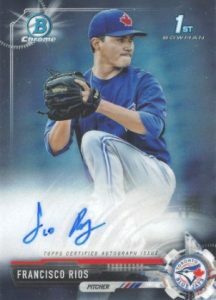 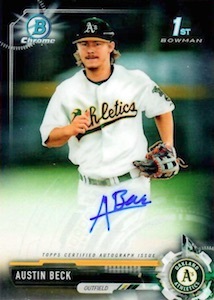 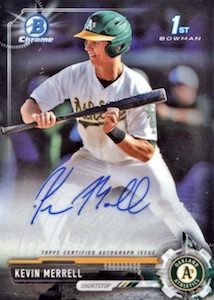 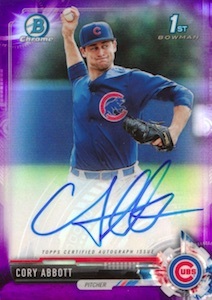 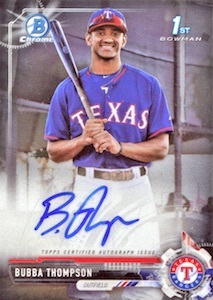 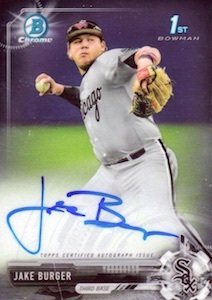 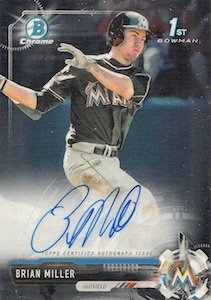 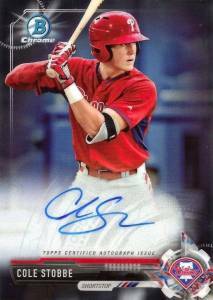 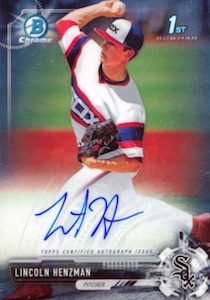 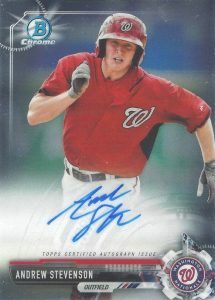 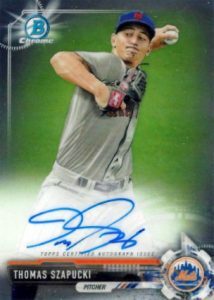 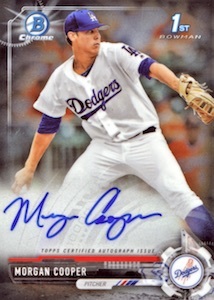 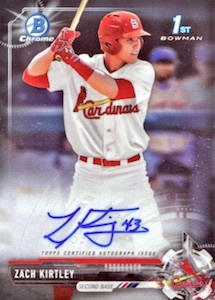 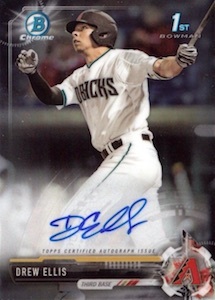 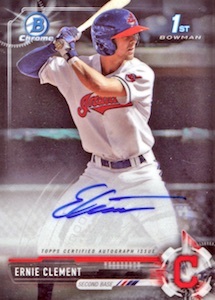 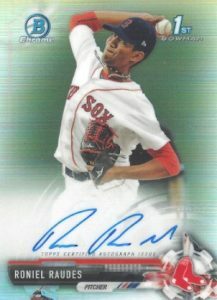 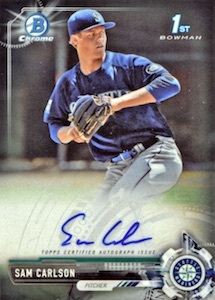 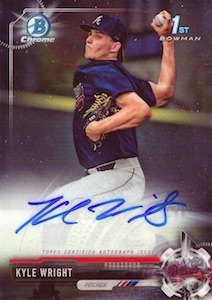 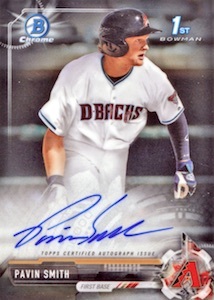 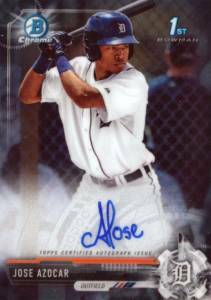 No matter if you view them as rookie cards or not, Bowman Chrome Prospect Autograph cards are an institution. 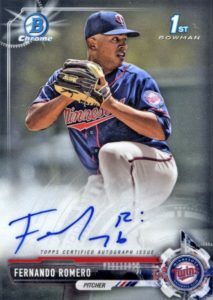 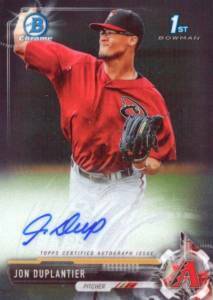 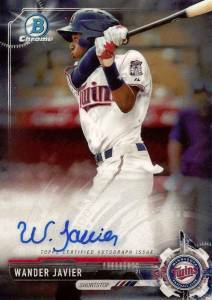 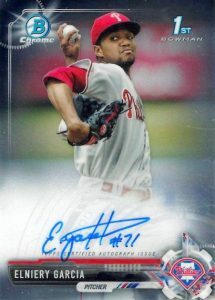 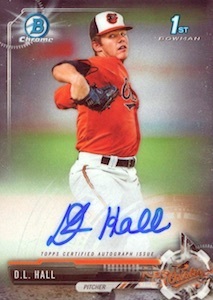 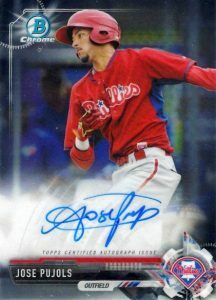 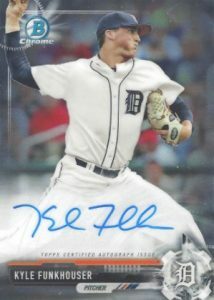 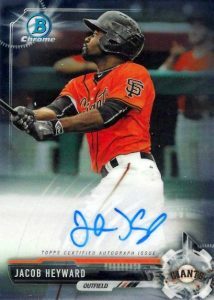 Spread across multiple MLB products, it is not just one thing that makes these some of the most popular, valuable and pursued cards in the hobby every year. 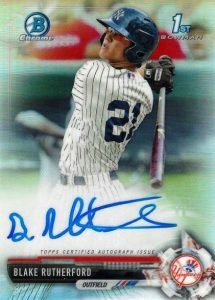 Collectors eagerly await the rollout each season, all the while knowing it could be several years until the player gets his chance to shine. 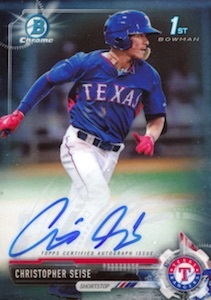 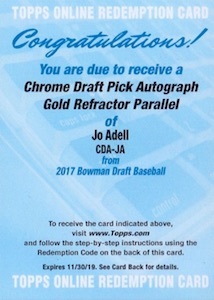 Of course, that is not literally the case for the 2017 Bowman Chrome Prospect Autographs, which display a shine straight out of the pack (ba-dum-bum!). 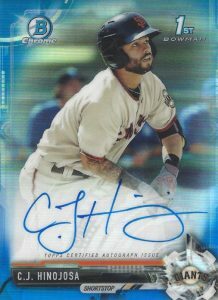 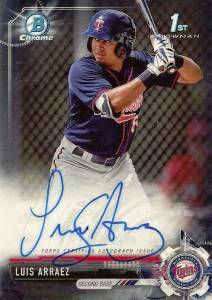 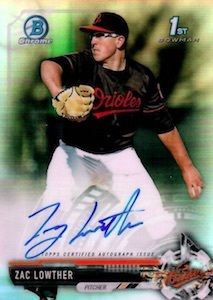 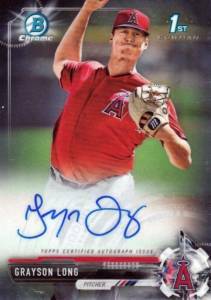 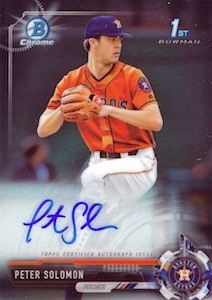 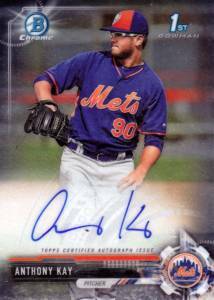 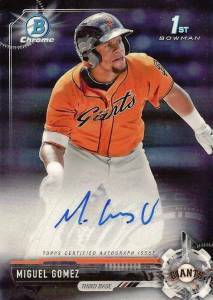 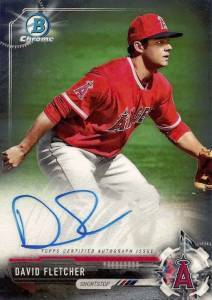 They also boast on-card signatures, vivid Refractor parallels and, for many players, some of their very first licensed baseball cards. 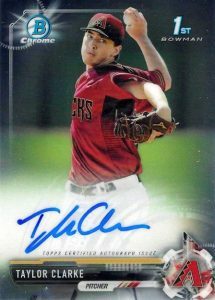 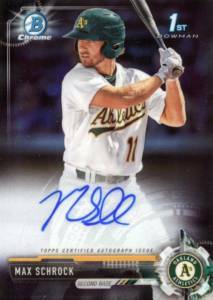 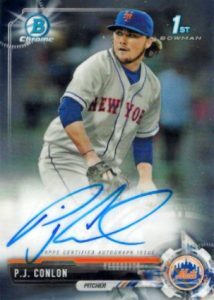 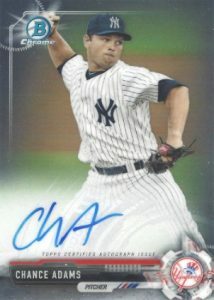 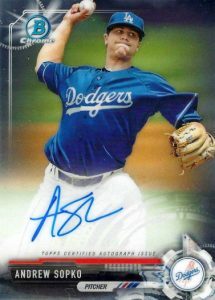 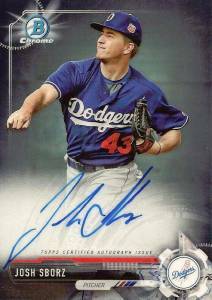 Shop for 2017 Bowman Chrome Autographs on eBay. 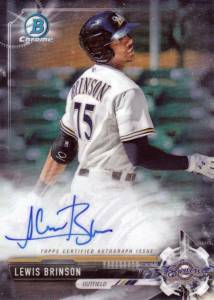 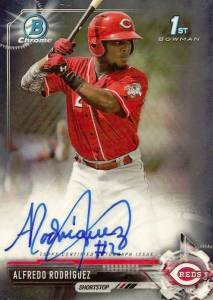 As is normally the case, the 2017 Bowman Chrome Prospect Autographs lineup gets underway with 2017 Bowman Baseball at the end of April. 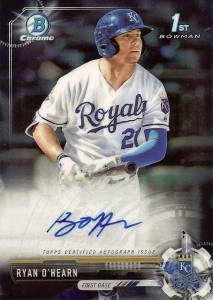 From there comes 2017 Bowman Chrome Baseball, in September, and 2017 Bowman Draft Baseball is an end-of-year set, releasing in December. 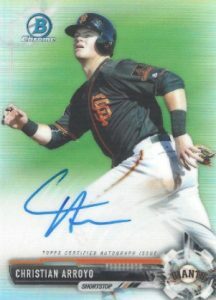 Shop specific cards or track prices on eBay using the player links below. 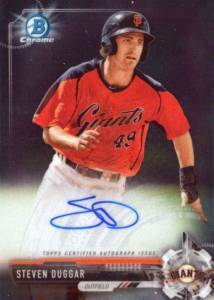 MiLB listings provide complete player information and stats. 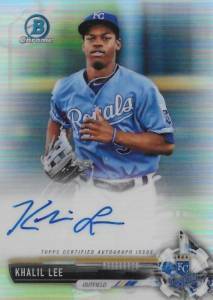 2017 BOWMAN CHROME DRAFT ROYCE LEWIS 70TH BLUE AUTO 70 BGS 9.5 TRUE GEM !!!! 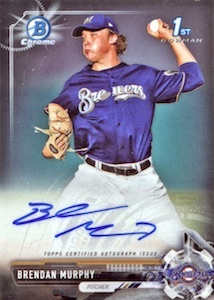 Is Kort Peterson on the list? 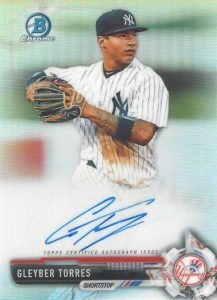 This is the confirmed list at this point. 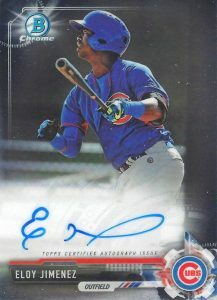 The final checklist will have more names.